Can I Stop a Foreclosure Without Having to File Chapter 13 Bankruptcy? What's the Difference Between Chapter 13 & Chapter 7? Personal bankruptcy is a method that may be used to get out from under unmanageable debt and make a fresh start, albeit with a negative impact on your credit ratings. There are two options available to the individual debtor. A chapter 7 filing liquidates assets to pay off creditors, while a chapter 13 filing allows the debtor to retain more assets and work to pay off his or her debts. At Clark & Washington, our knowledge extends beyond these court-supervised procedures to include debt repayment and collection options that negate the need for a bankruptcy filing. Our experienced bankruptcy attorneys can help you choose the right course of action for your unique situation. 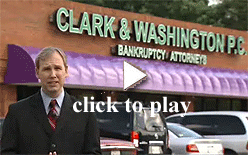 Call (813) 345-5954 to speak to a Clark & Washington bankruptcy specialist and make an appointment for a FREE consultation. 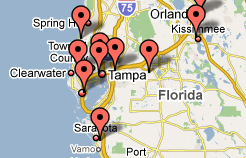 At the Tampa, FL bankruptcy law firm Clark & Washington P.C. ; we understand the stress and trepidation that comes along with overwhelming debts and the prospect of filing for bankruptcy. With more than 25 years experience, our attorneys and staff are well equipped with the knowledge to help you get all the information you need, and it’s free. Call one of our local offices today to schedule your free consultation with one of our skilled lawyers and find out why law firm Clark & Washington is Tampa’s largest bankruptcy filer. We request your tax transcripts. We attend all of your court hearings. Credit Counseling done in our office. Credit reports obtained same day. © 2003-2010 Clark & Washington, P.C. All Rights Reserved.